REDUCE AND BLOCK: Heat, Air, Light, Dust, Noise, Gaps, Shavings, Chips, Sparks Below are both Sectional Overhead and Rolling Drum Dock Door Brush Weather Seal Guides. 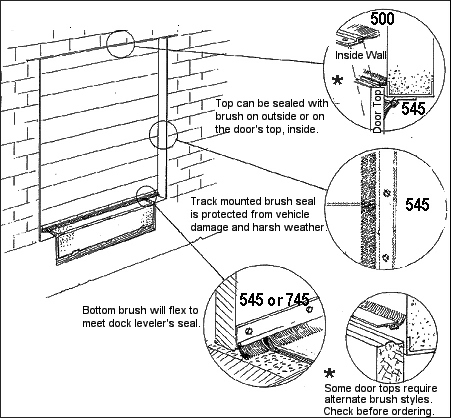 Angles and sizes vary with different doors, illustrated below are some of the most common installations. #5 size brushes will work for most applications, #7 brushes should be used for heavy duty usage or sever conditions. Outside or inside, angle mount (545) on door. With recess door slats and large gaps on the sides and tops typical seen with rolling drum doors, we usually recommend #7 size brushes. #5 brushes can be used as an alternative. Outside, straight mount (700) on the header. Outside, angle mount (745) on the jam (optional inside reverse angle (730) mount on the track). 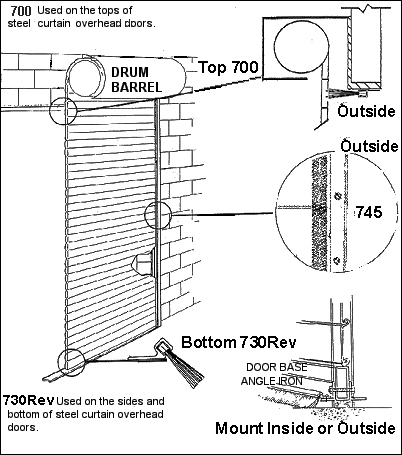 Outside or inside, if the door has angle iron use a 730R reverse angle mount otherwise (745).